And yet, one more fun filled week in Randall Hall. Student entries for the annual juried exhibit are due Monday through Wednesday. 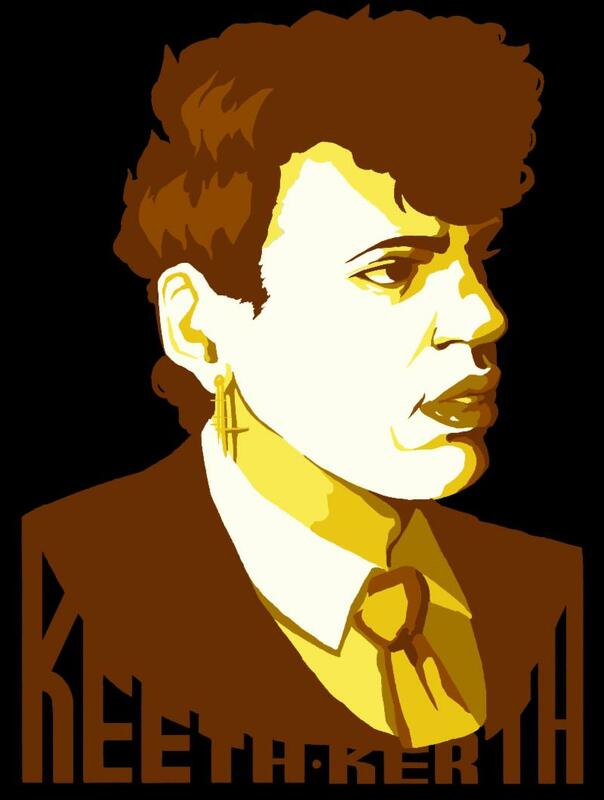 Multi-disciplinary artist, Noelle Mason presents an artist lecture on Tuesday in Randall 117. Alex Solis presents his BFA senior exhibition “Amnistia” in Randall 231 with the artist reception on Tuesday after Noelle's talk. 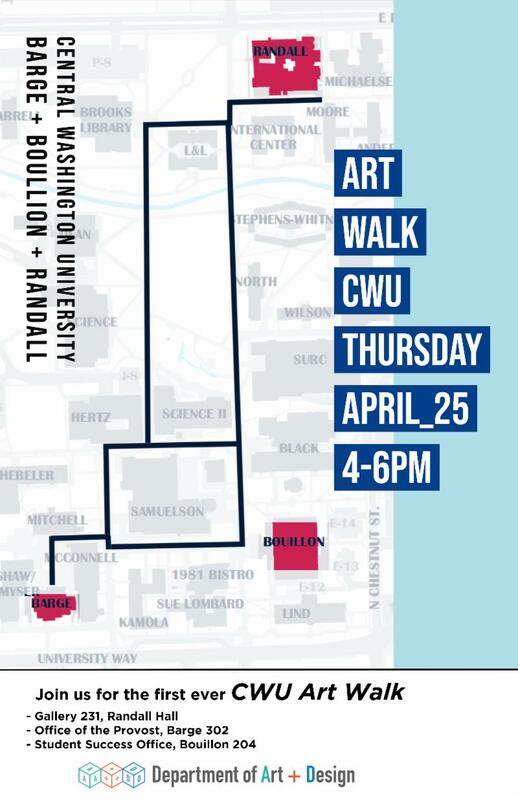 This Thursday you have the opportunity to view 20 students Art + Design work at CWU's first Art Walk . 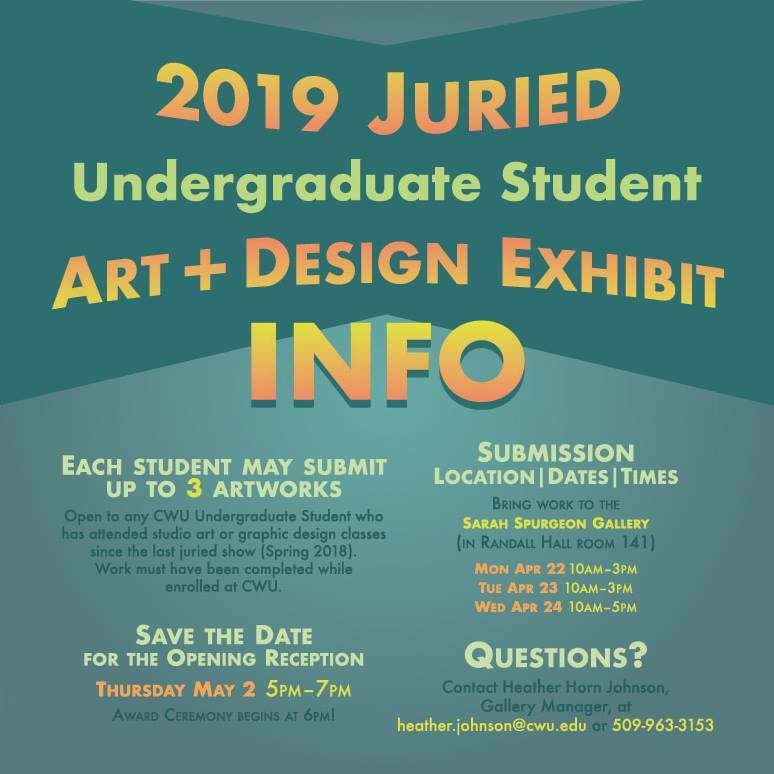 The three galleries participating are Gallery 231 in Randall Hall, the Office of the Provost in Barge Hall room 302 and the Student Success Office in Bouillon Hall room 204. Monday, April 22 - 10:00 a.m. – 3:00 p.m.
Tuesday, April 23 - 10:00 a.m. – 3:00 p.m.
Wednesday, April 24 - 10:00 a.m. – 5:00 p.m.
Submissions are due by Wednesday, April 24, at 5:00 p.m. 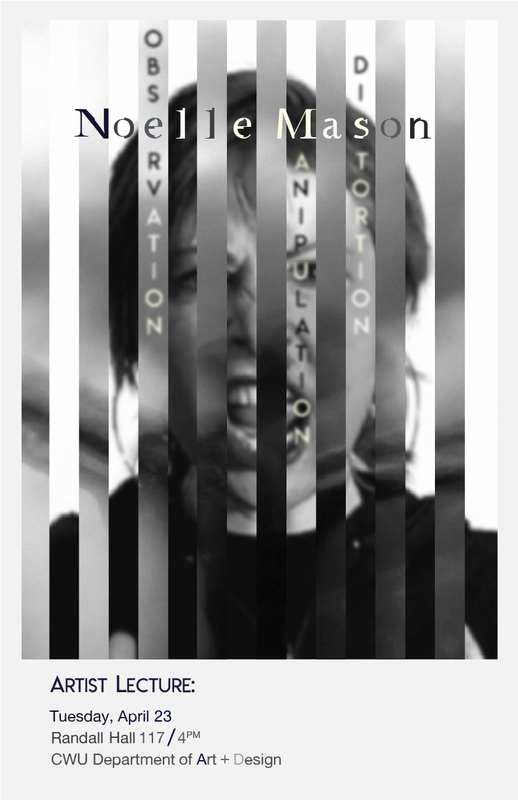 The CWU Department of Art + Design will feature a lecture by visiting visual artist Noelle Mason on Tuesday, April 23, at 4:00 p.m. in Randall Hall 117. Noelle Mason is a multi-disciplinary artist whose work examines the power facilitated by systems of visual and institutional control. Noelle has shown nationally and internationally in a variety of non-traditional spaces, galleries, and institutions including the National Museum of Mexican Art, Orlando Museum of Art and the Museum of Fine Arts St. Petersburg. 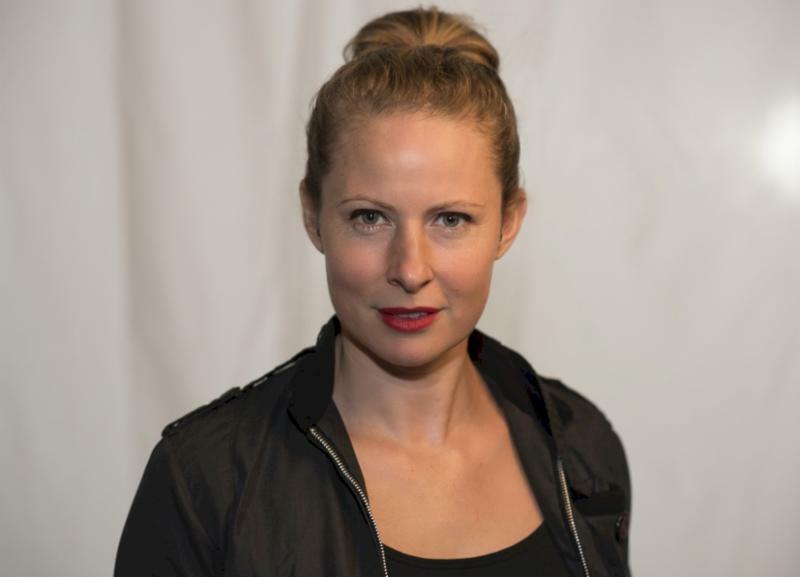 She is the recipient of a Joan Mitchell Foundation Artist Grant, Jerome fellowship, Santo Foundation Individual Artist Grant, the Florida Prize for Contemporary Art and the Southern Prize. She receieved her MFA in Studio art from The School of the Art Institute of Chicago and is currently an Associate Professor of Art at the University of South Florida. Mason’s work is radical and ground breaking as she reimagines the boundaries in art as well as in social issues. She has firmly established herself as an artist at the leading edge of her discipline who can transform images through a variety of sculptural and craft mediums into a cathartic and illuminating presentation of new ideas about shared cultural trauma. From racism to the war on terror, from the experiences of undocumented immigrants to the impact of capital punishment, Noelle explores and illuminates the most dehumanizing aspects of our society. An opening reception for “Amnistia” will be held from 4:00 to 6:00PM on Tuesday, April 23 in Gallery 231. The exhibit will run through April 26. In marginalized communities, art and sculpture were not recognized or appreciated enough to preserve. 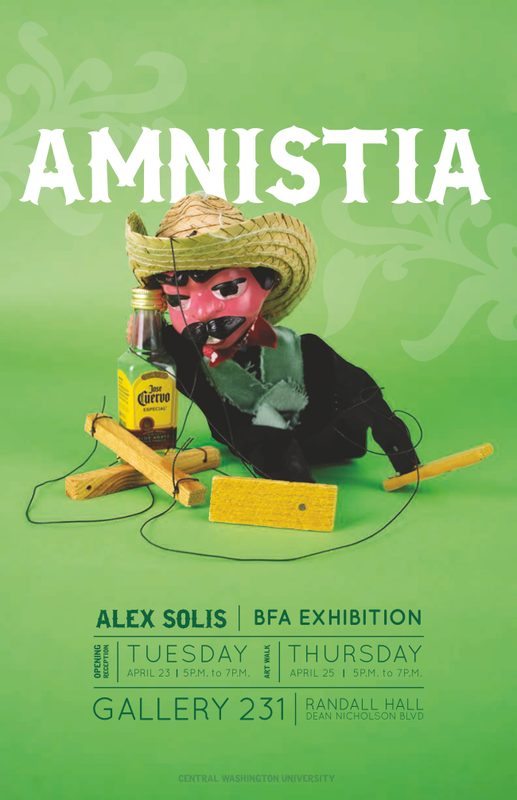 In “Amnistia” Alex Solis invites you to see that reality of his perspective as a second-generation Hispanic man in the U.S. in his upcoming exhibit. The metaphorical work allows viewers to see his personal experiences and current immigration issues within the Hispanic American community. Alex works with stoneware clay to build narrative sculptures and relief work. Using metaphorical symbolism, the viewer is left only with clues to decipher what is going on within the context of the pieces. Most of his work is hand-built ceramics and Alex also enjoys working with different mediums like photography, foam, and wood for installations. There will be a second artist reception on April 25 at 4:00-6:00PM as part of CWU’s first Art Walk with three galleries open displaying more than 20 student artists. 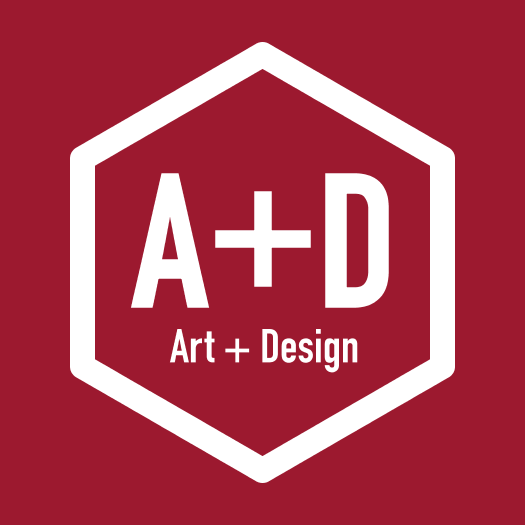 Don’t miss your chance to see art and design work by 20 students on exhibit in three student galleries on the CWU campus. The Art Walk will be held from 4:00 to 6:00 p.m. on April 25. The three galleries are Gallery 231 in Randall Hall, the Office of the Provost in Barge Hall room 302 and the Student Success Office in Bouillon Hall room 204. There will be two multi-passenger golf carts offering rides between the buildings. College of Art and Humanities student ambassadors will be your drivers. The graphic design program at Central Washington University proudly presents a collection of selected works from winter quarter. This work, on display in the Provost Gallery, was completed by 15 students representing seven classes in the graphic design area, under the direction of Associate Professor David Bieloh and Assistant Professor Justin Beckman. This collection of portfolio work consists of corporate identity, branding, user interface design, package design, advertising campaigns, collateral design, poster design, and more. REMNANTS, an exhibition of 4 graduating studio art majors, is in the Office of Student Success Gallery. Christine Dunlap, Makayla Miracle, Trinity Oribio and Carlos Lee Sullivan present remnants of their creative work as they prepare their journeys beyond Central. AMNISTIA, a senior exhibition by CWU student Alex Solis is on display in Gallery 231 in Randall Hall. Growing up as a 2nd generation Latino in rural Washington, Alex likes to create and work with his hands. The culture and struggles he witnessed throughout his life, inspires his artwork. Alex employs ancient and medieval strategies and narrative sculpture in his creative process. In addition to the gallery exhibits, there is plenty of public art, part of the State of Washington’s public art program, along the walkways between the venues. Enjoy a late afternoon filled with art and design on the campus of Central Washington University. Parking is free in university lots after 4:30 p.m. 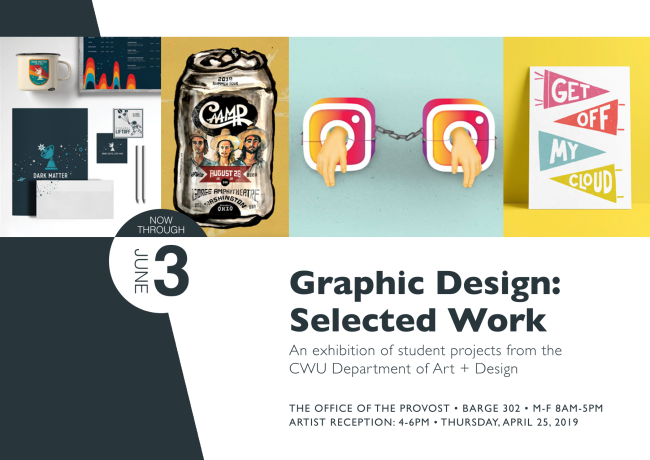 The graphic design program at Central Washington University proudly presents a collection of selected work students in the graphic design program. Work on display was completed by 15 students representing seven classes in the graphic design area, under the direction of Associate Professor David Bieloh and Assistant Professor Justin Beckman. This collection of portfolio work consists of corporate identity, branding, user interface design, package design, advertising campaigns, collateral design, poster design, and more. The Student Art Club : The regular meeting is 4PM Thursday in the Breeze Thru. Come for a quick discussion on the business of art led by Professor Justin Beckman. And then we are off to the Art Walk! Keith (KEETH) shirts are on sale until May 1. If students dont order their shirt, they wont get one. Shirts are $25. See Lee Sulivan to get your's preordered today! And, go see the KEETh exhibit in the Nook Gallery. Waffle Tuesday. Come have a waffle on Tuesday in Randall Hall. Clay Club meets on a weekly basis every Friday at 5pm in room 124. The club goal is to have a time and place for those who are interested in clay to gather and participate in sales and other clay related events. Clay Club has demonstrations. No prior skills in clay required, also no upfront fees required. Randall Hall on Dean Nicholson Blvd. I hope to see you around the department!